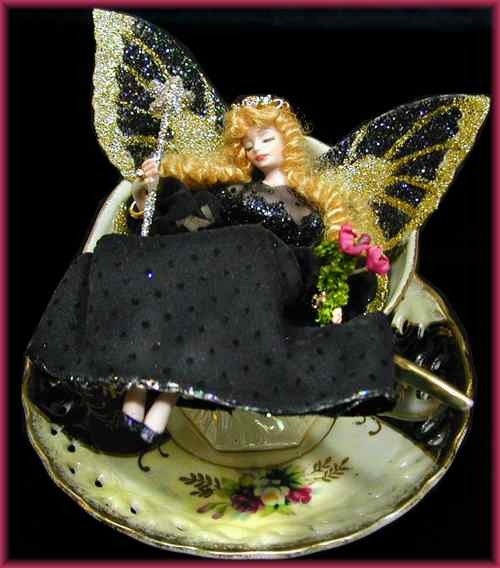 If you've wanted to adopt a lovely tea cup fairy, then Onyx is the one for you. 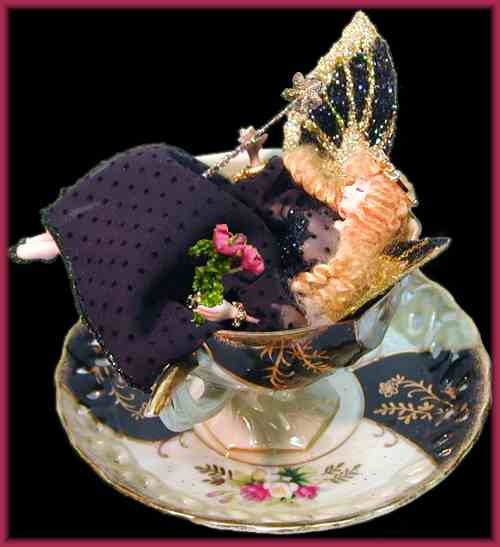 Fairy Princess Onyx is attired in a hand-made dress of sheer silky fabric with tiny, tiny dots in the design. She has a black slip and black silk pantaloons underneath. She wears black glitter "slippers". Her crown is a beautiful wearable cubic zirconia fashion ring and her fairy jewelry really sparkles. 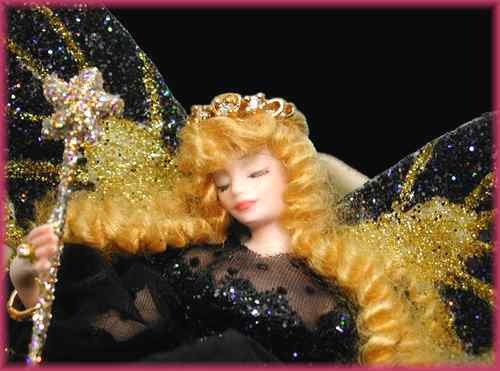 Her hand-made, hand-painted wings are done in black glitter and trimmed in gold to match her dress and her cup and saucer. The unusual cup and saucer are unmarked but are probably from Japan. Very, very lovely, indeed! Fairy Princess Onyx is approx. 5" tall and has a wingspan of 4.75". Her cup is 3.25" tall and her saucer is 6" in diameter. Like all JoAnnJ creations, she is a one-of-a-kind work of art and is signed by the artist. She comes with a signed certificate of authenticity.